I know it's the easiest meal to cook and it requires actually not a single cooking skill, but it's always delicious and simple to accomodate with a lot different side dishes depending on the season. Why simple? 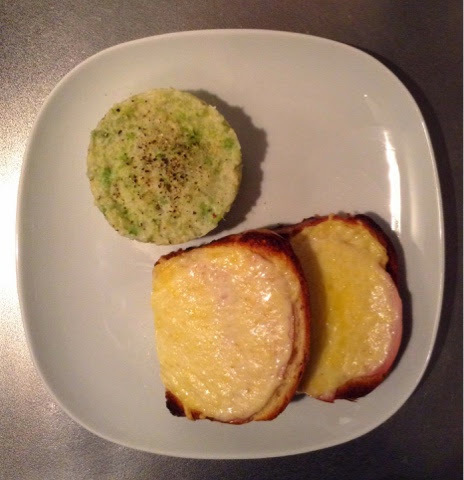 Because in my version of the croque-monsieur I do not use bechamel, I find this heavy and it is totally unecessary when the bread is soft and tasty. So the base for my croque-monsieur is a very good and fresh pain de mie (it works with toasts but it's so much less tasty). I top it with a very little butter, a slice of ham (the quality of the ham also makes a lot: I use always Kamakura ham) and some gratted cheese (gruyere, comte... Anything you like), toast in the oven, and ready to eat! In winter I often serve it with cabbage or cauliflower. This time it was cauliflower and romanesco roughly mashed with a lot of pepper and a bit of nutmeg.